This is my favorite, go to look for Spring/Summer. I think a kimomo is the perfect piece, it makes every outfit better and also doubles as a super cute beach coverup. The one above is from last year, but they are available at all price points just about anywhere. I prefer the longer versions with a thicker weight, nothing see through really. I linked one that I have been eyeing for a YEAR from Free People and will grab soon. Addy poncho (love this top! ); Rose gold birk’s; similar boyfriend jeans; similar shorts; Jeffrey Campbell lace up heels, old (eyeing THESE!) ; Camo clutch; Botanical chandelier earrings. 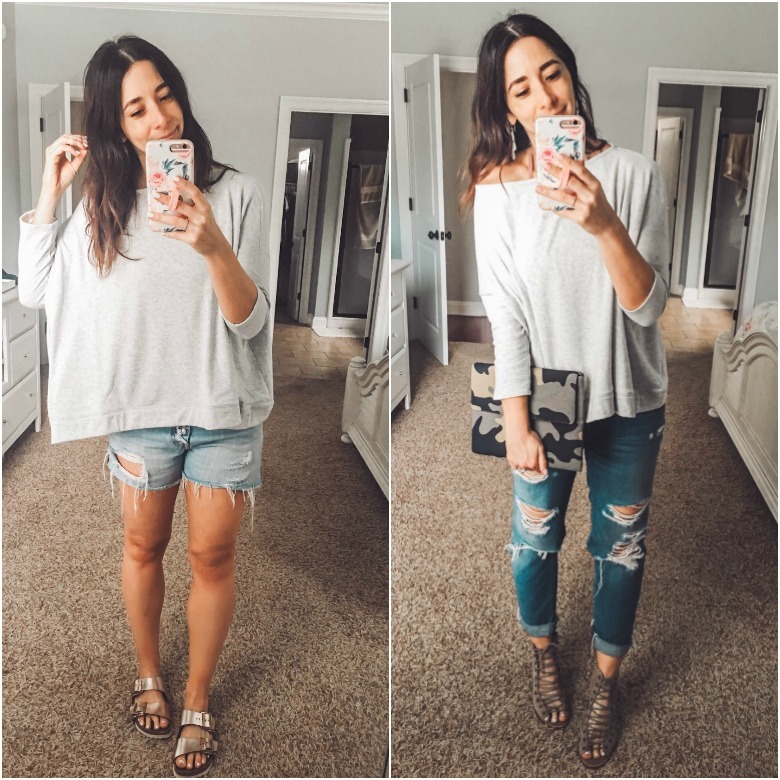 I love this top from Stella + Dot (I’m a stylist!) It is a lightweight sweatshirt material and is so perfect for Spring and Summer. I am wearing a size small and it is generously sized. I like how it sits a little off the shoulder, and the drape on it is really great. It’s a top that is really comfortable, yet looks great dressed up. 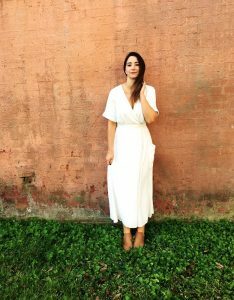 I styled it two ways, one really casual and the other for a date night. I loved how it looked with the S+D camo clutch and boyfriend jeans. 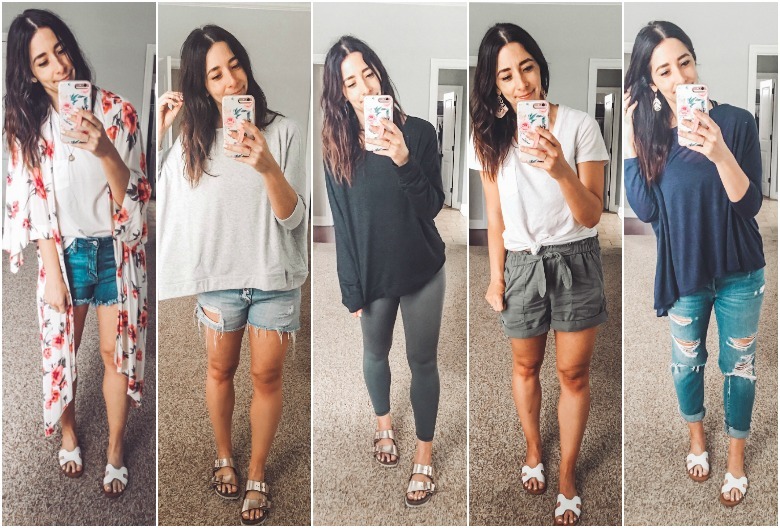 You can shop these pieces via the links above or right HERE! Gapfit sweatshirt, old; Aerie leggings; Rose gold birk’s. I went uber comfortable this day as we had about 65 million hours of baseball/softball practice this day;) I love these lightweight leggings for days like this. I don’t love them for workouts as much, they tend to roll a bit as I move and sweat shows through (though I am doing CrossFit and it is aggressive there! ), but I LOVE them for regular life. Fave $8 tee; Aerie camp shorts (wearing a medium, size up); Target slides. You guys! These shorts! All the heart eyes. They have an elastic waist, they feel like a dream on, and they will be perfect for humid Alabama summer days. I bought them in the chambray color as well. I sized up to a medium as this particular brand runs small. Sorry for the wrinkles, I wore them right out of the package and then napped in them lol. Another Stella + Dot top that I love! This top is lighter than the gray one above, you need to layer it over a tank as it is a little see through. 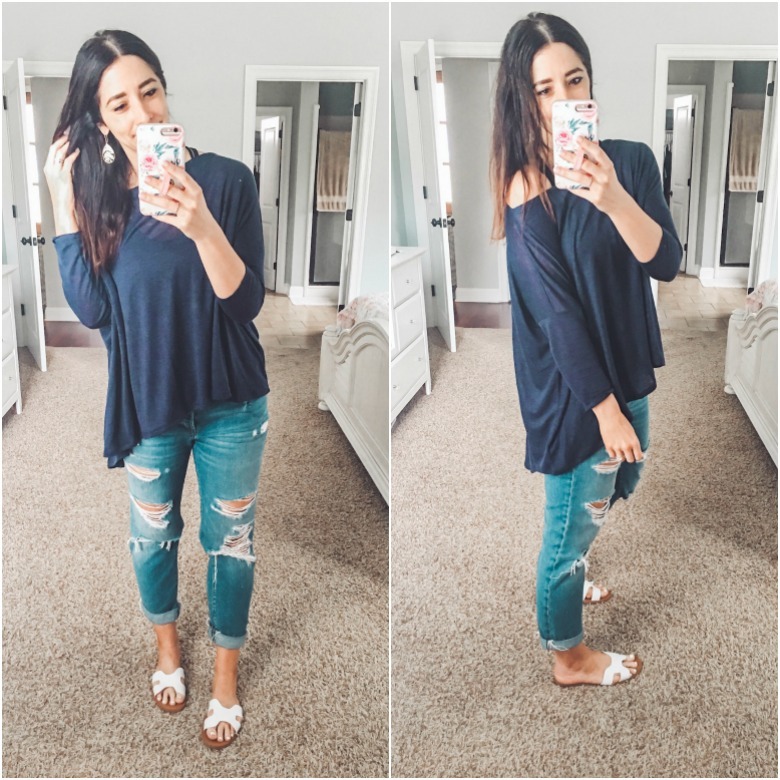 I love the high low hem and thought it would look great with denim for now and shorts and sandals as it gets warmer. You can shop all Stella + Dot finds HERE! I’ve also been buying more dramatic earrings now that I’m a stylist for S+D and I’m loving the change! Fave $8 tee; Next Level stretch denim shorts (size up 1 size); Sam Edelman slides. Now these amazing, mom friendly shorts! They are from American Eagle/Aerie and they have a great midi length (meaning, not 1 inch past my goods…;) They fit like a glove, yet feel like leggings on. I love the distressing and that I don’t feel like I have everything hanging out, yet I still feel cute in them. Shorts have always been hard for me. I never want them too long or too short, and I’m not a fan of the current super high waist yet super short thing you see most places. Does anyone else think there’s a clothing market missing for “not 20 years old, yet not wanting something marketed for an older generation”? I’m 38 and I’m not willing to look like a teenager at my kids’ sporting games, you know? But I still want to feel confident and like myself, because I feel really great inside and out. ANYWAY, these shorts and this particular style (Next Level Stretch, midi length) shorts are really great. Just size up 1-2 sizes. I typically wear a 4 or 6 in this brand and these are an 8 and fit like a glove. I bought THIS pair and THIS pair. Tell me, what clothing do you have a hard time finding?